UK teachers have been leading the way in inspiring young people about their futures. This was demonstrated to a global audience last week. To coincide with the start of the World Economic Forum (WEF) in Davos, an event took place at the local primary school with a range of volunteers from the world of work. Although located just a minute away from the WEF registration desk, this was the first time that these children had had any contact with the delegates who visit Davos every year. Organised by the UK education charity, Education and Employers, the event was a milestone for its Primary Futures programme. This free scheme, which was developed in conjunction with primary teachers from the UK and in partnership with the NAHT, started at the Athersley South Primary School in Barnsley, Yorkshire five years ago. In preparation for the visit, the pupils were asked to draw a picture of the job they wanted to do when they grew up. This built on the ‘Drawing the Future’ study launched at the World Economic Forum last year. Undertaken in partnership with the TES, it showed for the first time that gender stereotyping starts at primary school and is a global issue. The analysis of the children’s drawings from Davos were illuminating and startling to their teachers. The following day in Davos the OECD and in conjunction with the charity launched a new report entitled: Envisioning the Future of Education and Jobs: Trends, Data and Drawings. It looked at the future of education and jobs and the challenges and opportunities presented by the Fourth Industrial Revolution. Andreas Schleicher presented the findings to a packed auditorium. Paying tribute to the role of teachers, he underlined that ‘education is the key to dealing with the world’s global trends’ and that ‘teachers needed an opportunity to allow time for deeper thinking and creativity of thought’. He quoted the example of the teaching system in Japan that had done this and as a result has had the greatest rise in creative thinking of OECD countries. He concluded by saying that the skills mismatch observed in the labour market has its roots in primary school, and that giving all children, regardless of gender and social background, the same chance to meet professionals in a variety of fields is the key to widening their view of the world of work. The presentation was followed by a panel discussion with Deloitte’s Global Chairman David Cruickshank; the Rt Helen Clark former Prime Minister of New Zealand; UK teacher, Andria Zafirako; along with Nick Chambers, CEO Education and Employers charity. The event was live streamed by Deloitte and the whole presentation and panel discussion can be viewed here. It was fantastic to see the work of UK teachers being celebrated in this way. Over 4,000 schools have already signed up to the free Primary Futures programme which gives them access to over 50,000 volunteers. From apprentices to CEOs, or archaeologists to zoologists, all willing to give up time to go in and support their local school. On the same day the charity also published a report for Teach First with practical resources for teachers. Available on the Education and Employers website, where they can be downloaded for free. 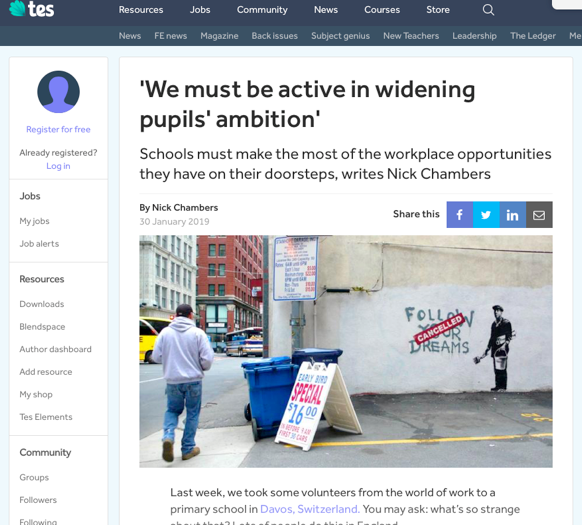 Working with teaching colleagues, the charity has produced, ‘Hallmarks for Success’ which provides measures for the success of activities in engaging young people, another example of leadership from the UK’s teaching community.